The final day of Star Wars Celebration Chicago was on a Monday, which was a bit odd. Usually Sunday is the last day and you’re either in a mad rush to leave at the end of the day or you wait till Monday and leave at your leisure. The big panel that day was the 20th anniversary of The Phantom Menace. I didn’t win the lottery for it, and instead of heading to the live stream stage to catch it, I opted to go to the Lucasfilm Publishing Writers Roundtable. I had no idea what to expect, but as a lover of the books it seemed like a good bet. There was an interesting group of writers at the panel: Claudia Gray, Justina Ireland, Daniel Jose Older, Cavan Scott, and Charles Soule. They talked a bit about writing, writing for Star Wars, and various things along those lines. It was a fun discussion. However, it all led up to a very mysterious thing called Project Luminous. They showed pictures of all five writers hanging out together at Skywalker Ranch, they showed a slide of Kenobi’s quote “the Force is what gives a Jedi his power. It’s an energy field created by all living things. It surrounds us and penetrates us; it binds the galaxy together” but they ended it with “Until…” The whole thing was very secretive. They would only say that all five writers are working together on it, and it’ll be out in 2020. They wouldn’t even say what format the project is so we don’t even know if it’s a book. Afterwards I went to The Art and Craft of Video Game Writing panel which included author Alexander Freed. They talked about what goes into writing for video games and gave lots of advice to those who might be considering it as a career. Very informative panel. 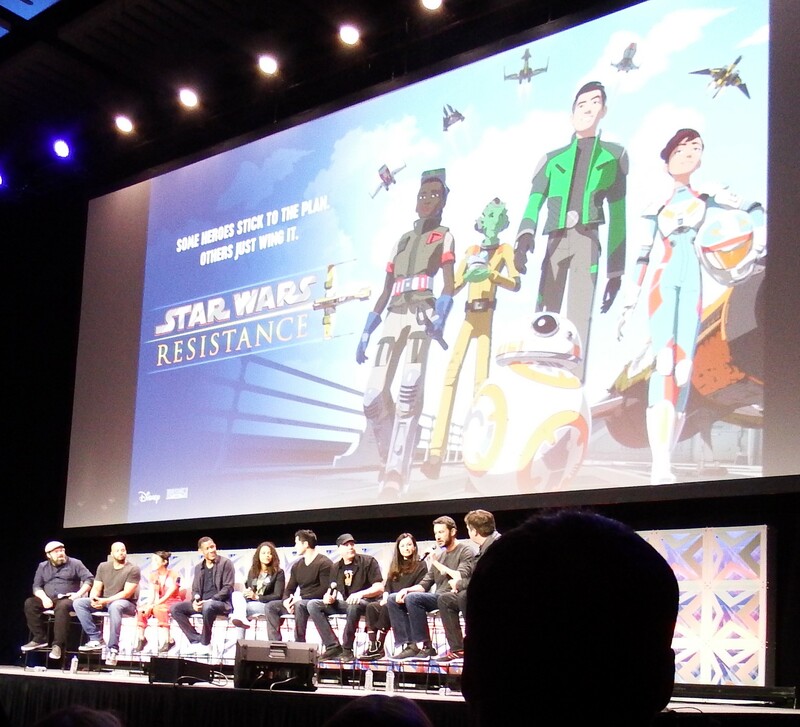 Then I headed to the Star Wars Resistance panel where we not only got to see the cast and hear them talk about the show, but we also saw the first episode from season two. 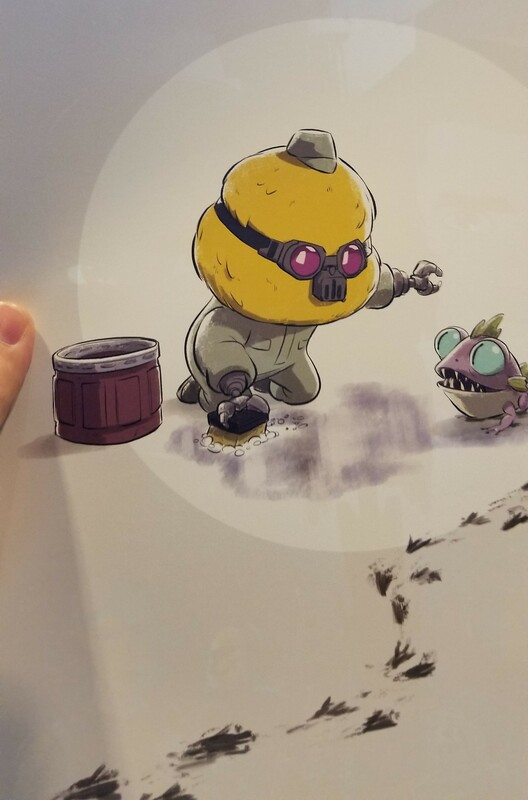 Everyone at the panel also got a double sided poster. On the back was Opeepit cleaning up after a gorg. With it being the last day, it was also the last chance to catch a podcast on the podcast stage, and I was thankful that I was able to catch the Lords of the Sith Podcast. To finish off the whole convention was one of the last panels of the day, The Mythology of Star Wars, hosted by Dan Z. from Coffee With Kenobi. Overall, I had a lot more fun this time around than I did at the last Star Wars Celebration in Orlando. While the lines had a habit of changing day-to-day, and the lottery system wasn’t perfect, I managed to make the most of it. Part of that was setting my expectations and changing my focus. Rather than going after the big panels, which always results in the big lines and the biggest hassles, I opted for smaller panels. The result was a less hectic experience. Being a fan of podcasts, the podcast stage was a place I often visited, and one of the best stages other than the live stream stage. While it can be fun to get the crowd experience in the big arena, the actors are typically far far away. Going forward, I think one of the best things they could do is increase the number of panels and schedule panels that are guaranteed to have a big draw simultaneously, thus splitting the size of the crowds. As is, the big panels aren’t always a huge pay off, even if you win one of the lotteries. I also think the exclusivity factor of certain footage in the panels is a bad idea. I completely understand making the airing of an entire episode of a show exclusive to those in the room, but things like trailers and sizzle reels should not be kept exclusive as those are things everyone wants to watch over an over again the next day. Also, April is probably not a good time for a convention in Chicago. It was certainly cold and windy every day, and there was even some very light snow one day. Nevertheless, I had a good time.